Congratulations to Keno Schwalb, a runner-up at last night’s Young Software Engineer of the Year Awards. His final year project IDS test comparison of intrusion detection systems using malware samples was shortlisted earlier in September. The Young Software Engineer of the Year accolades are awarded to the best undergraduate software projects from students studying computer science and software engineering in Scotland. 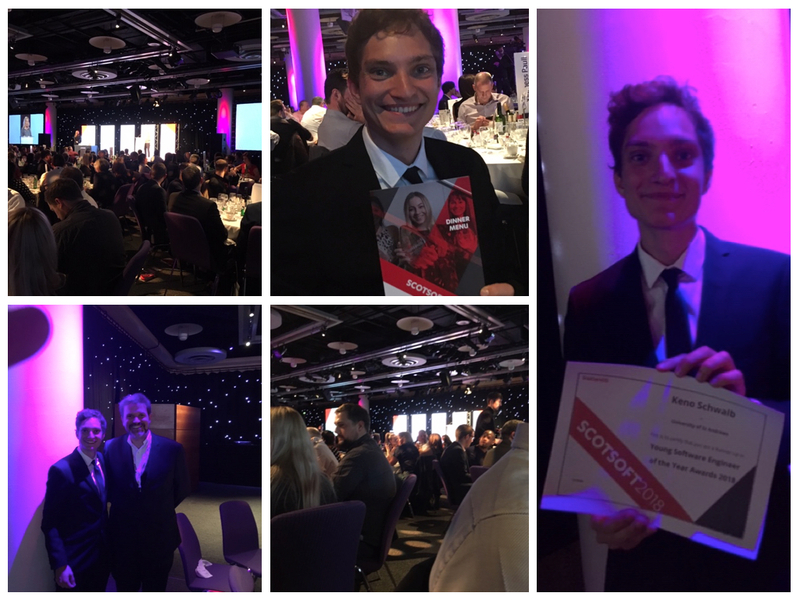 The awards were announced at the closing event of ScotSoft, Scotland’s leading tech conference at the Edinburgh International Conference Centre. Previous finalists and prize winners have included, Gala Malbasic, Simone Ivan Conte, Sam Elliott,Thomas Grimes, Alistair Scott, Craig Paul, Angus MacDonald, Ben Catherall, Graeme Bell and Ian Miguel. 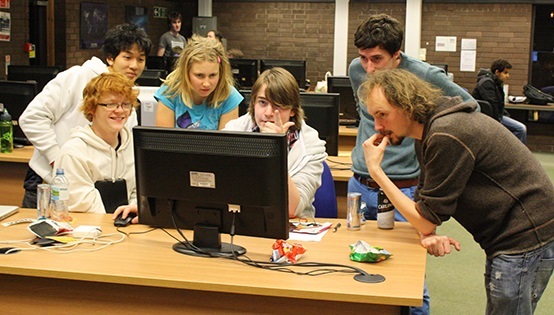 The number of finalists is further testament to the quality of talented students graduating from the School of Computer Science at St Andrews. 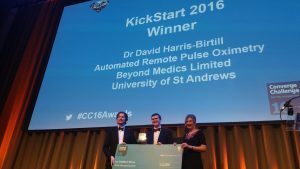 Congratulations to Dr David Harris-Birtill, who was announced the winner of the Converge Challenge KickStart award at a ceremony in Edinburgh yesterday. The converge challenge competition rewards an early-stage idea or a new product. David won a cash injection prize of £3,000 to kick-start Beyond Medics – Automated Remote Pulse Oximetry, a camera based system that remotely measures patients’ vital signs. The virtual reconstruction of St Kilda developed by the Open Virtual Worlds Group, has reached the finals of Scottish Gaelic Awards in the category Gaelic as an Economic Asset. The awards highlight aspects of Gaelic culture, education and language showcasing excellent work undertaken to maintain cultural heritage. The event taking place in November will embrace a variety of traditional and virtual entertainments.The Awards will be presented at a high-quality dinner in St Andrew’s in the Square, Glasgow on November 18th. 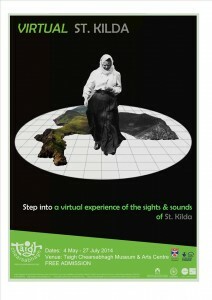 Good luck to all involved in the virtual reconstruction and museum installation. In recognition of academic excellence for his outstanding research work and entrepreneurialism Dr. Per Ola Kristensson is amongst the most outstanding academic talent documented by The Royal Society in their Royal Prizewinners list for 2014, announced today. The Prize was founded in 1855 by Sir Thomas Makdougall Brisbane, for particular distinction in the promotion of scientific research. In 2013 Per Ola Kristensson was named as one of the people most likely to change the world by the prestigious MIT Technology Review’s list of Innovators under 35. Described as visionary he appears at number 11 in IMPACT 100. People like Per Ola Kristensson are the shapers of the future where social interaction and new technology are concerned. His research interconnects human-computer interaction, artificial intelligence and machine learning allowing intelligent interactive systems to be developed, that enable people to be more creative, expressive and satisfied in their daily lives. 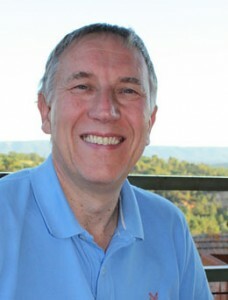 Dr. Kristensson also works in the areas of multi-display systems, eye-tracking systems, and crowdsourcing and human computation. He is a Lecturer in the School of Computer Science, a member of the SACHI research group and is also a Member of the RSE Young Academy of Scotland. We are all delighted at the rightful recognition of Per Ola and his world-leading achievements. 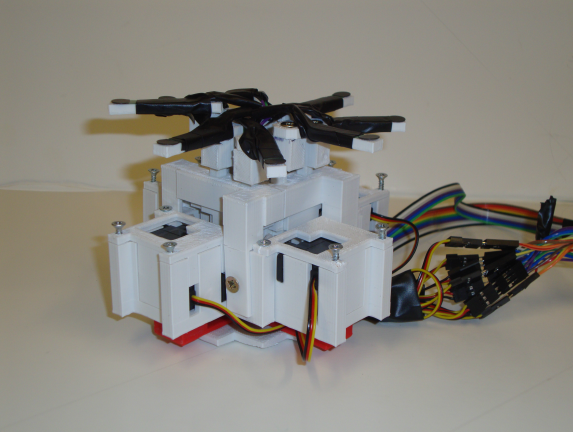 Last year he was the only UK member of the TR35, the most prestigious annual list published by MIT Technology Review. And now the Royal Society of Edinburgh has recognised his research. Per Ola is an excellent colleague who brings real enthusiasm, insight and dedication to whatever he does. 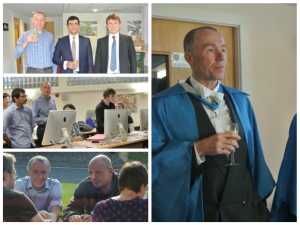 Be it supervising an honours student, teaching, leadership in SICSA or working with industry. His work in intelligent interactive systems is laying the ground work for how the world will interact with computation in the future. Juliana Bowles, the School Disability Coordinator, was runner-up for the new Frotscher Helping Hands Medal for Excellence in Supporting Students. This recognises her selfless commitment to providing support to students at St Andrews. In the current academic year, we have been very happy to welcome our first totally blind student, Saad Attieh. Juliana has coordinated and largely provided our support for Saad’s studies in Computer Science. She made contact with his teachers in Edinburgh, learned about Braille (including the different ways of representing mathematics in Braille) and in depth design and preparation of teaching materials for accessibility. She has researched, selected and commissioned a range of equipment for preparing accessible diagrams and handouts. She has checked over lecture slides, coursework and exams, nagged other lecturers, including professors, to get their slides ready in time, and attended many lectures to check that the lecturers’ delivery is appropriate. We hope to be welcoming another partially sighted student in 2013-14. 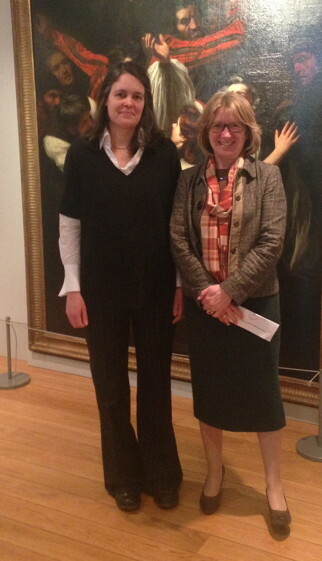 The photo shows Juliana with the Proctor, Professor Lorna Milne, at the award ceremony in the MUSA galleries (with a slightly alarming painting as backdrop). Congratulations to Per Ola and colleagues Ha Trinh, Annalu Waller, Keith Vertanen and Vicki L. Hanson. Their paper “iSCAN: a phoneme-based predictive communication aid for nonspeaking individuals” received the ACM SIGACCESS Best Student Paper Award at the 14th International ACM SIGACCESS Conference on Computers and Accessibility (ASSETS 2012) earlier this year.